Follow the ‘register now’ link, and click ‘Volunteers register here’ from the home page, or click you employers unique Inspiring the Future registration URL. If you’re a member of a professional body, please type and search for the professional body when completing your profile in the section, ‘My memberships of Professional Association’. Whether you are interested in being approached about being a school governor in your chosen volunteering area/s. Schools/Governors will search for volunteers from their ’Find Volunteers’ page, and message appropriate volunteers and ask them to get involved in an activity they have coming up. Volunteers can accept/decline the event. If the school/college request is accepted, once it has taken place an automated feedback form is sent to the volunteers involved. We ask about how the event went. We strongly recommend that this is completed, as it allows us to keep an eye of the quality of volunteers and whether the service is working for both parties. We also use your feedback to report to funders, which will help to keep this service completely free to schools and volunteers. 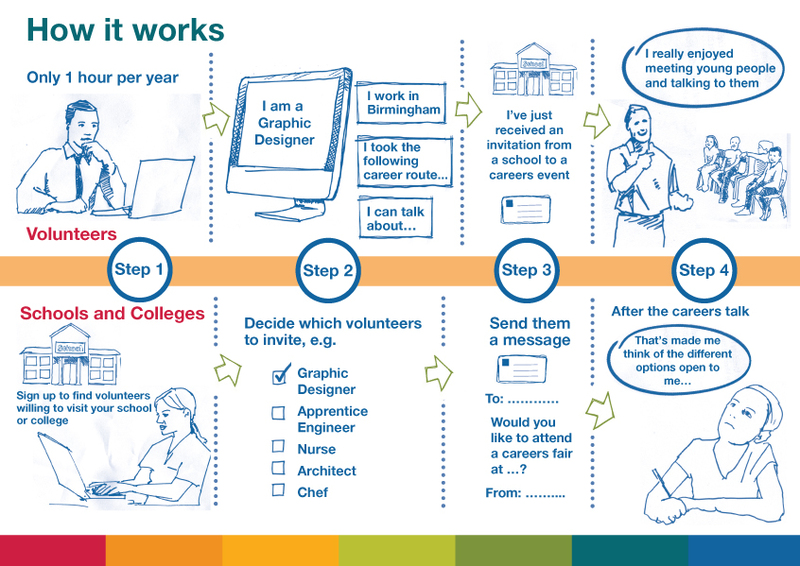 Read our volunteer profile guide to help you get the maximum number of invitations from schools and colleges. The ‘Hint and Tips’ for volunteers registered with Inspiring the Future is a guide to help your prepare for your visit to a school or college.